Checkout Date & Times: Location; 4020 Radtka Dr SW Warren, OH 44481 Removal: Friday, 8/18/17, 4:00-6:00 PM. Bring your labor, packing blankets,straps Mobile Home Removal: On or before 8/31/17. Mobile home auction not contingent on lot rental approval by trailer park. Driving Directions: Driving Directions to Auction: Take I-76 west of Youngstown to Bailey Rd. exit, go north on Bailey Rd. to Hallock Young Rd., then east to Radtka Dr. and south to address. Terms And Conditions: All sells to settle the estate online only & is subject to court approval. Auction By Order Of: Alida Hunter, Executrix of the Darlene Hunter Estate. Trumbull Co. Probate Case #2017EST0505 All property is sold AS IS, and ALL SALES ARE FINAL. It is the buyer's responsibility to determine condition, age, genuineness, value or any other determinative factor. Russ Kiko Associates Inc. (Kiko Auctioneers) shall endeavor to describe in detail each item and any pertinent information about it. Kiko Auctioneers will not be responsible for any errors or omissions in the description of the merchandise. Bidder agrees that everything is sold AS IS and that they may not return any item they purchase for any reason. Kiko Auctioneers will not be held responsible for any interruption in service, errors, and/or omissions, caused by any means and does not guarantee continual, uninterrupted or error free service or use of the Site. Bidder acknowledges that this auction is conducted electronically and relies on hardware and software that may malfunction without warning. Under no circumstance shall bidder have any kind of claim against Kiko Auctioneers or anyone else if the Internet service fails to work correctly. Kiko Auctioneers reserves the right to withdraw or re-catalog items in this auction. Successful bidders will be contacted with the actual street address for pick up of items. If items are not picked up within the scheduled pickup time, ownership reverts back to the Seller, whom may resell or dispose of items and Buyer will not be refunded. For Tax Exempt Buyers: Email Tax Exemption Certificate with paddle number and sale name to djohns@kikocompany.com prior to bidding. Otherwise tax will be added to the sale if applicable. 1995 Skyline Mobile Home with 48 ft. awning, treated entry ramp, vinyl sided, pitched shingle roof, gas heat, 5 axels, 3 bedroom, 2 full bath, vaulted ceilings, includes ...moregas stove and dishwasher (no hitch or wheels included with trailer). Gas heat, central air. Mobile Home Removal: ON or BEFORE August 31, 2017. 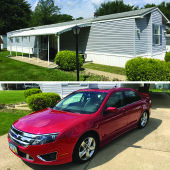 (Mobile home auction not contingent on lot rental approval by trailer park) Mobile Home Park charges $225 per month. Visit www.kikoauctions.com to download & fill out the lot rental agreement.